Scorse alcune settimane divorate per tutti noi dagli impegni didattici del primo semestre, ci permettiamo di somministrarvi una “iniezione di richiamo” relativamente all’adesione al convegno nazionale “Egitto e Vicino Oriente Antichi: tra passato e futuro”, che si svolgerà a Napoli, il 13-14 giugno 2019. Vi ricordiamo che per questa occasione si è scelto un tema specifico, assai prossimo agli interessi di ricerca di molti fra di noi, ovvero “The Stream of Tradition”. La genesi e il perpetuarsi delle tradizioni in Egitto e nel Vicino Oriente antico. Sono previste una tavola rotonda (Le tradizioni scrittorie extra moenia: l’allografia) e una sessione finale, (Eredità e prospettive degli studi) con interventi su invito (Storia del Vicino Oriente antico, Archeologia del Vicino Oriente antico, Egittologia, Assiriologia, Anatolistica, Ebraistica, Semitistica, Iranistica). Coloro che intendono presentare una relazione per una delle cinque sessioni di lavoro sono pregati di inviare titolo e breve abstract di massimo 2000 caratteri spazi inclusi entro il 10 gennaio 2018. Gli autori delle proposte accettate dovranno mandare entro il 15 marzo 2019 il testo del proprio intervento, eventualmente integrato da slides, immagini, tabelle o quanto si ritenga opportuno. È prevista anche una sessione poster per la quale le proposte andranno presentate secondo le medesime modalità. Il programma, la sede precisa del convegno e altre informazioni utili saranno forniti nella II circolare. È previsto un numero massimo di 150 partecipanti. 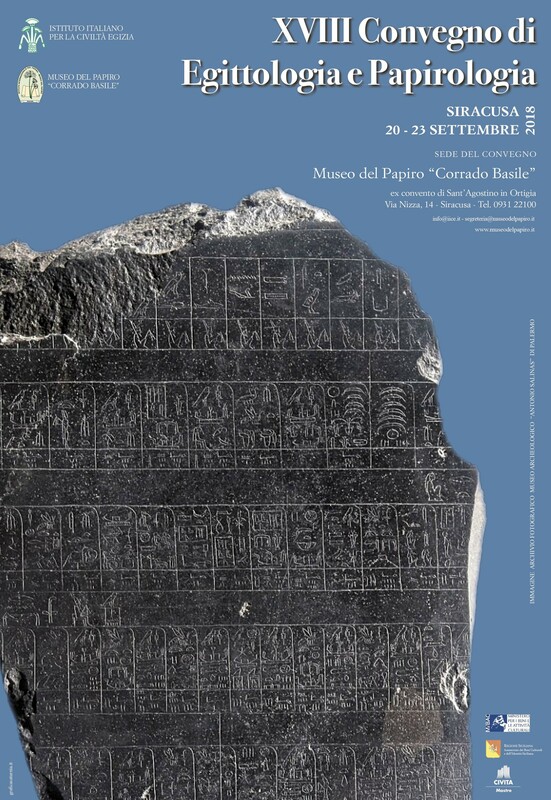 The opening of the 29th International Congress of Papyrology has been anticipated to Sunday July 28, at 5 pm, and will be in Teatro Apollo (Via Salvatore Trinchese, 13A), in the city center. Registration will begin on the same day in the nearby Castello Carlo V at 3 pm, where we will gather after the opening ceremony for a cocktail party. Registration will continue on Monday 29 at the University of Salento. Sessions will take place at University of Salento, Studium 2000 Building 6, in Via di Valesio, close to the Papyrological Museum. Thematic sessions: will include individually submitted papers of no more than 15 minutes, followed by 5 minutes discussion. Panels: are intended to focus on specific topics reserving a larger than usual part of their time for discussion. Proponents are invited to organize the speakers within the assigned time slot (1 hour and 50 minutes). Speakers are invited to submit a full version of their papers to the Organizing Committee () by July 15, to be uploaded on a page of the Congress web site accessible only to the Congress members. This will hopefully allow more in-depth discussions among the participants. 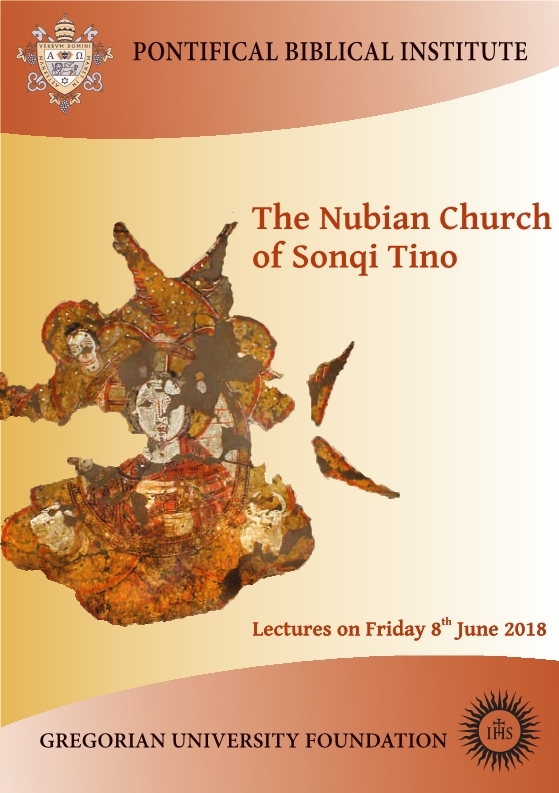 Workshops: are proposed for lectures on new editions or re-editions of texts and are intended to reserve a larger than usual part of their time for discussion, with presentations of no more than 10 minutes followed by 10 minutes discussions. The images and transcriptions of the texts to be discussed must be sent to the Organizing Committee () by July 15, to be uploaded on a page of the Congress web site accessible only to the Congress members. This will hopefully allow more in-depth discussions among the participants. Posters: will be exhibited during all week. They must be 103 cm wide and 187 cm high. English, French, Italian and German. By February 15 the Organizing Committee will communicate the acceptance of the proposed papers, panels, and posters. There are several hotels and B&B offering a variety of accommodation in the neighborhood of the Congress venue. The Organizing Committee has negotiated special rates for participants in some hotels, where several rooms have already been reserved. These reserved rooms will be available from mid-January until March 31. A booking procedure will be available on our web site by January 15. We warmly recommend you reserve the rooms far in advance because the week of our Congress will be a high season period for Lecce and Salento region, which are very popular touristic destinations. Lecce is a very attractive Barocco style city. The local landscape, rural and maritime at the same time, is rich in natural, archaeological and architectural highlights. The Organizing Committee is planning social activities and excursions for the Congress week. Sunday July 28 after the opening ceremony a reception will be held in Castello Carlo V, just a few steps apart, where a cocktail party will be offered by Centro Internazionale per lo Studio dei Papiri Ercolanesi to celebrate the 50th anniversary of its foundation. August 1 the traditional Gala Dinner will be held in Ex-Convento degli Olivetani, an amazing Barocco style location. A short trip will be organized on Wednesday July 31 afternoon, to visit a museum in Galatone dedicated to Leonardo da Vinci. In 2019 the 500th anniversary of his death occurs. Special exhibitions will be organized in Lecce, Florence and Naples. Biblioteca ‘T. Pellegrino’ dell’Università del Salento” - Permanent exhibition of the Museo Papirologico. In Naples: Biblioteca Nazionale, Officina dei Papiri Ercolanesi, a selection of Herculaneum Papyri. The Organizing Committee is planning a few interesting tours within Lecce and other nearby towns for participants and accompanying persons. For details, please visit the web site (www.papycongress 2019.org). A booking procedure is available through the Registration Page and are managed by our event agency. Booking to the tours is mandatory by July 1 in order to be able to reserve guides and transportations. Tours of Lecce Barocca and of Jewish Lecce with Italian and Englishspeaking guides. Each exhibitor will be provided with: 1 table 1.60m x 0.60m, 2 chairs; electrical connection, Wi-Fi with Internet connection. Details about sending material, storage at the campus and setting up will be sent to confirmed exhibitors a month prior to the congress. The registration fee for exhibitors is 300 € and includes all the above, plus a pass to participate to all activities of the congress, including the Gala Dinner. Please send us an email at for any further detail or to register. The Organizing Committee wish you a Merry Christmas and a Happy New Year! As always, the Congress is an open forum for all branches of Egyptology. Participants, whether junior or senior scholars, are expected to present the highest standards of research. Kindly note that junior scholars will need at least a Master’s Degree (MA) or an equivalent degree in order to present either a poster or a presentation. The Congress will be held at the Marriott-Mena House Hotel, 6 Pyramids St, Cairo. Congress welcome and farewell dinner buffets. To register as a student please send a copy of your student ID card along with your registration. Please note that student IDs will be checked during registration. All amounts are payable in US Dollars or Euros. Registration fees must be paid via bank transfer. Participants must pay all bank charges and on-line payment commissions. Only transfers until June 30th, 2019 can be accepted. Written confirmation will be sent by electronic mail following registration. The bank wire transfer and other related fees have to be paid by the participant. If you need to cancel your registration, 60% of the registration fee will be refunded up to one calendar month prior to the Congress (October 1st, 2019). No refund will be granted if cancellation is made within one month of the Congress. Refunds may take up to six months after the conference. Any transfer fees will be deducted from the amount. 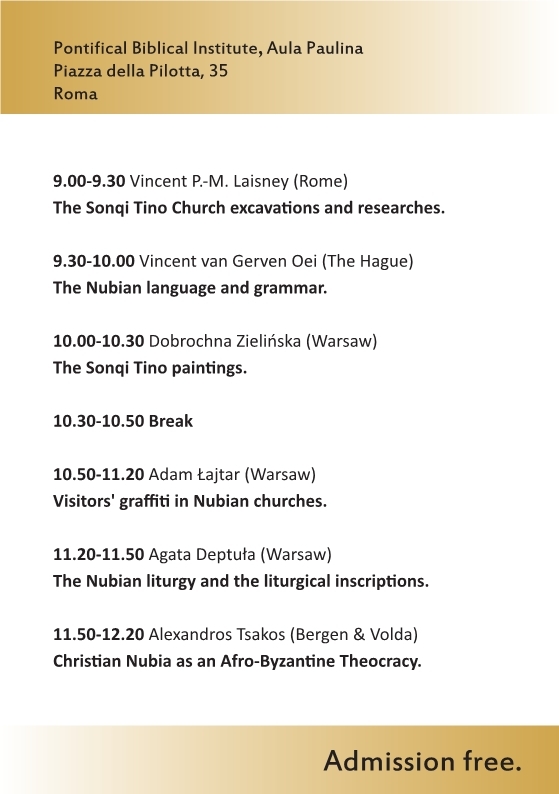 Sunday November 3rd, 2019; 15:00 Opening session and Keynote Lectures (TBA). November 4th-8th, 2019; Working sessions. 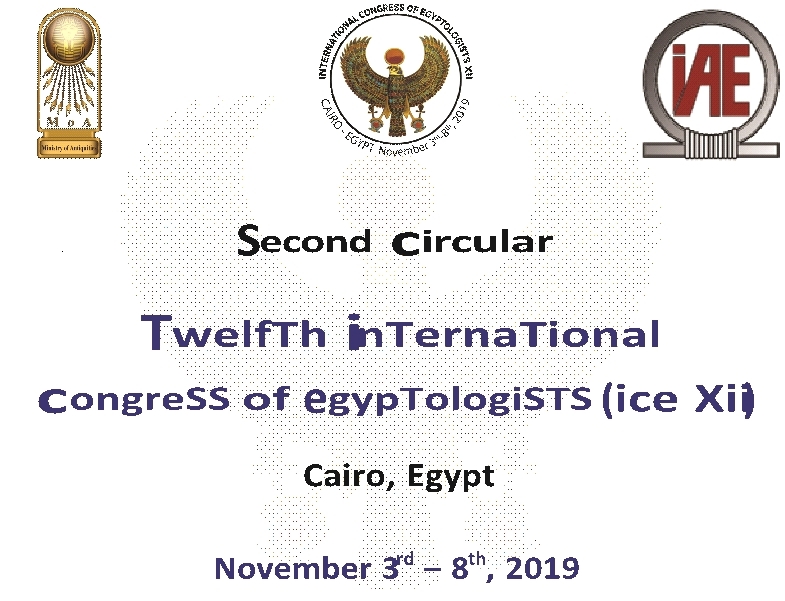 General Assembly of the International Association of Egyptologists. Friday November 8th, 2019 evening: Closing session. From November 3rd to November 9th, 2019: All participants will be offered free entrance to all open museums and archaeological sites in Cairo and Giza. All oral presentations and posters can be submitted to the conference proceedings, and will undergo peer review before they are accepted. Information for the proceedings will be released at a later time. Mr. Mohamed Saad - Ministry of Antiquities. We would appreciate disseminating this circular to any interested parties and through relevant networks.